Stunning views at this in-city beach front hide away. This three bedroom home is one of a kind, quiet, and rare to find this close to the city. Come relax and take in the breath taking views of the Puget Sound. The home features 3 bedrooms with queen sized beds, plush bedding and beach decor. The spacious great room has walls of windows to take in the view. Full kitchen is stocked with utensils and kitchen wares for entertaining up to 12+ guests. Enjoy use of gas BBQ on the upper deck off the dining area. Bulk head on the beach has fire pit for beach bonfires and owner provides firewood for guests. We're approximately three and a half miles to downtown Seattle. Easy walk to downtown and sculpture park on beautiful Elliott Bay. South exposure take in all of the Elliott Bay marina, Seattle high rises, Mount Rainer, Alki Point, the ship canal gateway to Seattle from the Pacific, the islands and Olympic Mountains. Beach walks two miles around Magnolia to the North and West during low tide... Walk all the way to Discovery Park light house, walk to Elliott Bay marina with acclaimed Palisades restaurant and Maggie Bluff's Beach Cafe. This home is the ideal Seattle get-away and a fun hotel alternative. We are madly in love with the location of this property! We are sure you will fall in love with it too! This home is designed to entertain. The kitchen is ready and available for your holiday dinners! Over looking the beach, Elliott bay marina, Mt. Rainer, DT Seattle, Alki point. Ideal of the out door BBQ. The view is excellent, and saw seals in the water almost every day. A short 10-15 minutes into downtown Seattle and lots of amenities an even shorter drive away. Looking forward to coming back. Very comfortable home with plenty of space. Gorgeous view, right on the water. Quiet area. We really enjoyed our stay! The Best View in Magnolia!!! This is a cozy and comfortable home, with an INCREDIBLE view of the city, the Sound, and THE Mountain. It is simply breathtaking. We loved falling asleep to the sound of the waves, and waking up to ferries and barges going by. The house was clean and tidy- and had everything that we needed. The street is private and secluded- a very peaceful and relaxing spot. Just minutes away from Magnolia Village, and also the scenic Magnolia Boulevard. It’s also a quick 10-15 minute drive downtown. Mary was wonderful to work with leading up to the trip- and Bill was a delightful and hospitable host. As a Magnolia Native, I couldn’t have been more pleased, and look forward to staying here again! Bill and Mary.....thank you, thank you! Cozy cottage close to the city with STUNNING views! Overall a wonderful stay! The owner and property manager were quick to respond with any questions we had regarding the property. Beautiful in city get away! If you are looking to get away from the hustle and bustle of metropolitan life, this is it. Greeted by seals and gulls every morning, no traffic, only the sounds and sights of the Sound! Lots of room, reasonable amenities, affordable, with responsive owners. We have just found our go to spot for when we visit family in Seattle. We will be back! My family rented this property for 10 days in July and loved it. Before I get into the pros and cons, please note that any “cons” are outweighed by the #1 “pro”, which is the view. 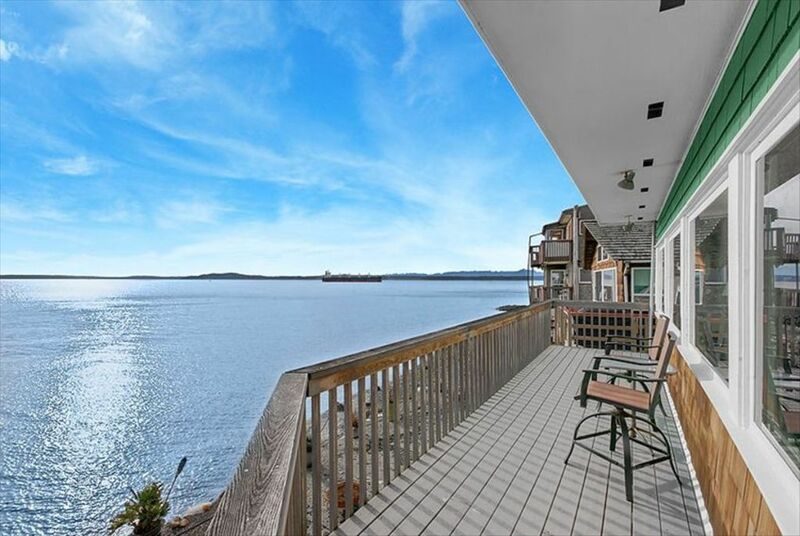 This house sits right on the water, with a fabulous view of Elliott Bay, downtown Seattle, even Mt. Rainier on a clear day. Waking up and coming home to that view was priceless and we would stay at this property again in a heartbeat for that reason alone. Fire pit! So much fun to roast marshmallows while watching the sunset. Balcony—another fabulous spot to sit with a cup of coffee or glass of wine and take in that view. Beds are really comfortable and linens are top quality. Front room is spacious and the large windows provide a great view. Bill, the owner, is available via text/phone anytime to answer questions and suggest restaurants, etc. He refunded us a bit of money when the housekeeping staff forgot to set up the aerobed as requested. Really nice guy. Some folks complained that the windows don’t have screens, but screens would interfere with that great view! That being said, we wished the side windows that face the neighbors had screens so we could create a nice cross breeze without getting bugs in the house. There was a lack of some basic items—no extra papertowels and trash bags or clean kitchen sponges. There weren’t enough spoons…no baking sheet…need a better wine opener… Small annoyances, but when on vacation, you don’t want to have to think about these things. The shower on the bottom level has 2 steep steps down into the shower; first step can be slippery. This may be an issue for people with mobility issues. There is a handrail to help. Parking is tricky. It’s fine if the renters next door don’t pull forward into your parking spot, which happened to us and we had to find them and ask them to move their car. The third bedroom (not shown in photos) has an odd layout. The bed is in an alcove of sorts, with no view of the bay. Not a problem for my kids, who didn’t care, but others might care. The owner should re-think his housekeeping service. The outside table was thick with grime, which I had to scrub off so we could use it. The linen closet was a mess. We also spent a few minutes hunting for towels until we realized they were still in the dryer from the previous occupants. They also didn’t set up the aerobed, even though the owner requested it. But you can't beat that view! Priceless!